A source close to the music service said it was "taken completely off guard" when it received notice of the move last Thursday. Singer Taylor Swift performs on ABC's Good Morning America to promote her new album, 1989, in New York, Oct. 30. Taylor Swift has removed all of her albums from Spotify. The service is trying to get her to change her mind. The service was also caught "completely off guard" by Swift's decision, which it learned of last Thursday. Swift&#39;s label, Big Machine Records, is reportedly in the process of selling itself for over $200 million. Swift&#39;s catalog hasn&#39;t been pulled from other streaming services, including Rdio and Beats Music. Fans criticized and praised the singer-songwriter&#39;s decision. Why did Swift remove her music from Spotify and not Beats Music or Rdio? A source at Spotify comments to BuzzFeed News: "We actually have users." A source familiar with Spotify's negotiations with Swift&#39;s label Big Machine Records told BuzzFeed News that the service was "taken completely off guard" by the decision to remove the catalog, first learning of the decision in the middle of last week and receiving a formal notice on Thursday. The source said there was no rationale given for the removal, but noted that Swift&#39;s label, Big Machine, is reportedly in the process of trying to sell itself for more than $200 million. The label, founded by music industry veteran Scott Borchetta in 2005, is distributed by Universal Music Group. "They think they can get a better sale multiple by creating scarcity to drive record sales, that&#39;s what this is about," said the source. "But they&#39;re only shooting themselves in the foot. Over the long term, streaming services only add value to catalog records." Other Big Machine artists, including Florida Georgia Line and Tim McGraw, remain on Spotify, but the source noted that "it&#39;s no secret that Taylor Swift is Big Machine and Big Machine is Taylor Swift." Google Play, iTunes, Pandora, and Rdio are still carrying Swift's tunes. @taylorswift13 please put your old music back on @Spotify this is ridiculous. They&#x27;ve already been out for years and you still get money. @taylorswift13 please put your old music back on @Spotify this is ridiculous. They've already been out for years and you still get money. 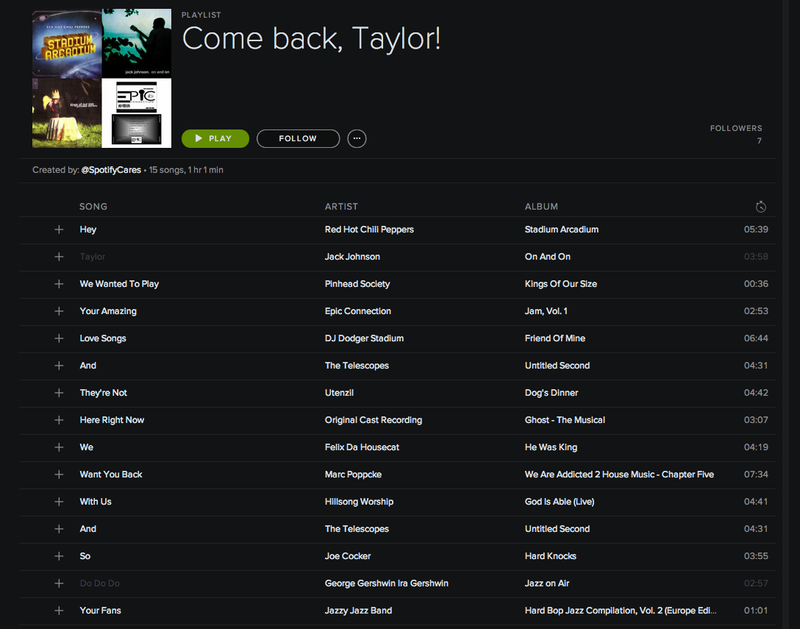 Big mistake by @taylorswift13 to pull #music from @Spotify. Fans should be able to listen the way they want to listen. Swift's music remains on Apple-owned Beats Music. Swift's back catalog, excluding her new album 1989, remains available on Spotify-rival Beats Music, which is owned by Apple. Taylor Swift has apparently removed all of her albums from popular music-streaming service Spotify. The move comes as a big blow to the service, which was already licking its wounds after being cut out of the rollout last week for Swift's new album 1989, which is expected to sell over 1 million copies in its first week on sale. We love Taylor Swift, and our more than 40 million users love her even more &ndash; nearly 16 million of them have played her songs in the last 30 days, and she&#39;s on over 19 million playlists. We hope she&#39;ll change her mind and join us in building a new music economy that works for everyone. We believe fans should be able to listen to music wherever and whenever they want, and that artists have an absolute right to be paid for their work and protected from piracy. That&#39;s why we pay nearly 70% of our revenue back to the music community.